Sacred To Her: Olive branch; Grass; Wandering Jew; Salt (as in ‘salt of the earth’); Museums. Associated with: Pax, Salus, Securitas, Fortuna. She was also paired with Hercules and Mercury. Greek Personification: Goddess Homonoia, the Greek personification of harmony. Iconography: Concordia is portrayed sitting or standing, wearing a long cloak and holding a sacrificial bowl or an olive branch in her left hand and a cornucopia in her right symbolizing the prosperity that comes with peace.. Sometimes she can be seen standing between two members of the Royal House who clasp hands. Concordia is the Roman Goddess of agreement and harmony. The sister of peaceful Pax, she’s very conciliatory and will do almost anything to avoid upsetting people. She was also responsible for harmony in marriage, as revealed by her epithet Concordia Conjugalis. Other epithets include Concordia Augusta (harmony of the emperor), Concordia Militaris (harmony of the army), and Concordia Provinciarum (harmony of the provinces). Concordia is one of the oldest of the Roman deities, having been worshipped since the earliest days of Rome. She was worshipped in many temples, but the oldest was on the Forum Romanum and dates back to 367 BCE and was built by Camilus. The temple also served as a meeting-place for the Roman senate. she had another temple nearby on the Capitoline Hill. In ancient Roman religion, Concordia is the goddess who embodies agreement in marriage and society. Her Greek equivalent is usually regarded as Harmonia, with musical harmony a metaphor for an ideal of social concord or entente in the political discourse of the Republican era. She was thus often associated with Pax (“Peace”) in representing a stable society. As such, she is more closely related to the Greek concept of homonoia (likemindedness), which was also represented by a goddess. Unlike many other Goddesses who were deified qualities, Concordia was worshiped from early times in Rome. She especially symbolized peace and agreement between the two classes of Rome, the plebeians or commoners, and the patricians or nobles. Concordia had a place in the festival of the Caristia or Charistia (meaning “Pardoning”) of February 22nd, a holiday celebrated by families in which it was traditional to reconcile differences and to mend quarrels or feuds within the family. Concordia was invoked for Her powers of bringing harmony and agreement, and other Deities invoked at the Caristia were Janus, the double-faced God of New Beginnings, Salus, the Goddess of Health, and Pax, Goddess of Peace. These four Divinities were honored with statues grouped together at the Altar of Peace (not the great big famous one built by Augustus, but a smaller one whose location is unknown). They were also said to be worshiped together on the 30th of March and the 30th of January, and Concordia was invoked by matrons on April 1st at the Veneralia, the festival of Venus Verticordia, along with Fortuna and Venus Herself. In the later days of the Empire, Concordia was worshiped as the bringer of marital harmony within the imperial family, and as such was called Concordia Augusta. She was depicted as a matronly woman, veiled and heavily draped, holding an olive branch, emblematic of peace, and a cornucopia, to symbolize the abundance that can be achieved when people work together in harmony. She sometimes wore a crown and held a sceptre, caduceus, or patera, a small offering bowl from which libations were poured. She is associated with the stork, which symbolized family devotion to the Romans, and the dove, universally a symbol of peace and gentleness; and sometimes a star, as emblem of hope, is shown near Her. 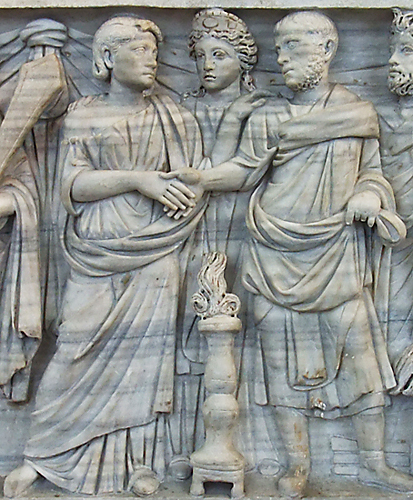 Another attribute of Concordia is the image of two clasped hands, both of which are right hands (like in a handshake), symbolizing two people agreeing. She is often shown on coins commemorating joint rule of leaders or the marriages of the imperial family. Inscriptions on coins refer to different applications of Concordia; these were probably not epithets, but rather illustrations of types of harmony, but I list some of them here: Concordia Militaris, “the Harmony of Armies”, Concordia Provinciarum, “the Harmony of the Provinces”, Concordia Conjugalis, “Harmony of Marriage”. In the early days of Rome the two classes had joined to drive out the tyrannical Kings and created a Republic; but it quickly became a Republic of the patricians who had all the wealth and power. The plebeians were barred from the Senate and other governmental and priestly offices, though they of course made up most of the army. In 494 BCE the plebeians had had enough, and, refusing to serve in the army anymore, deserted and camped out on a hill near the Anio River that they called the Mons Sacer, or the Sacred Mountain. The patricians, left defenseless, came to some kind of sense and reforms were instituted giving the plebeians more rights. To commemorate the compromises worked out between patricians and plebeians, a temple to Concordia was built in the northwestern end of the Roman Forum, backed up against the Capitoline Hill, near the Volcanal, a raised area that housed an altar to Vulcan. This temple was originally vowed in 367 BCE by the general Camillus and dedicated on July 22nd (which became Her festival) sometime afterwards. This temple was of somewhat unusual proportions due to the constraints of the site, but it was accorded one of the most beautiful in Rome, as it was finely made and entirely faced in marble. In later times it served as a museum of sorts, and many famous works of art were housed there. July 9th is the Day of Unn the Wise person. Also known as Aud the Deep-Minded, Unn was a great matriarch who established dynasties in the islands Orcadas, Feroe and Iceland. 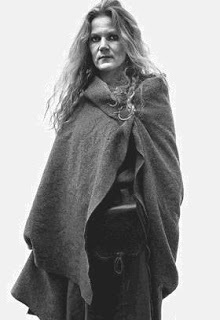 Unn was a powerful figure from the Laxdaela Saga who emigrated to Scotland to avoid the hostility of King Harald Finehair. She was the second daughter of Ketill Flatnose, a Norwegian hersir, and Yngvid Ketilsdóttir, daughter of Ketill Wether, a hersir from Ringarike. Unn married Olaf the White, son of King Ingjald, who had named himself King of Dublin after going on voyages to Britain and then conquering the shire of Dublin. They had a son named Thorstein the Red. She established dynasties in the Orkney and Faroe Islands by carefully marrying off her grand daughters. Unn then set off for Iceland. On her ship were twenty men, all of whom were free, but she was still the leader of them, proving that she was respected, but also that she was strong-willed enough to command a ship alone without the help of a man. In addition to the crew, there many other men on her ship, prisoners from Viking raids near and around Britain. They all came from good families, and were called bondsmen. Unn gave these men their freedom once they were in Iceland, making them freed-men, a class between slave and free, where they were not owned, but did not have all the rights of a free man. She also gave them all a great deal of land to farm on and make a living. Unlike most early Icelandic settlers, Aud was a baptized Christian and is commonly credited with bringing Christianity to Iceland. Aud erected crosses where she could pray on a prominent hill within her lands, now known as Krossholar (Krosshólaborg). As a settler in Iceland she continued to exhibit all those traits which were her hallmark-strong will, a determination to control, dignity, and a noble character. In the last days of her life, she established a mighty line choosing one of her grandsons as her heir. She died during his wedding celebration, presumably accomplishing her goals and working out her destiny in this life. She received a typical Nordic ship burial, surrounded by her treasure and her reputation for great deeds. 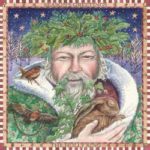 Note: In some pagan calendars this is shown of “Day of Un the Wise Person” which is a misprint.